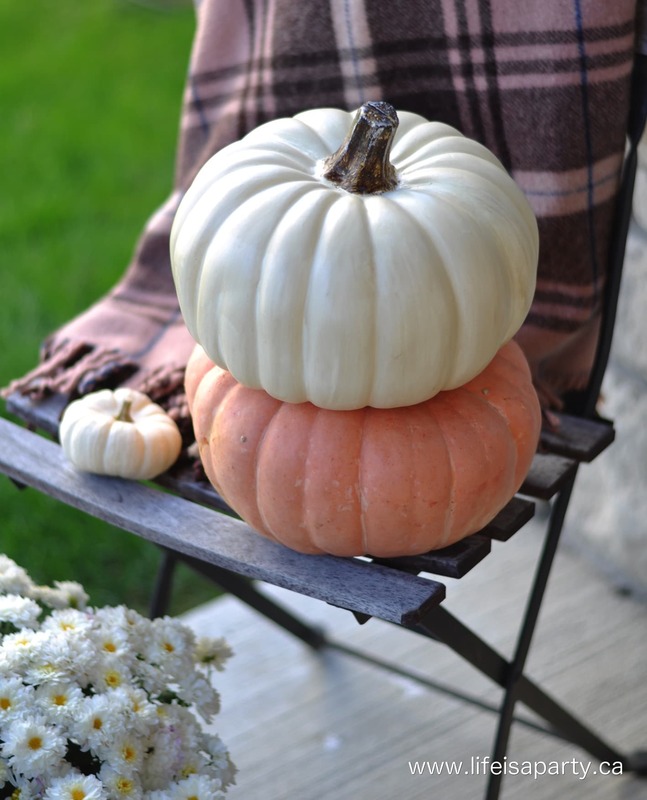 Yesterday was the first day of fall, glorious fall! I love fall. 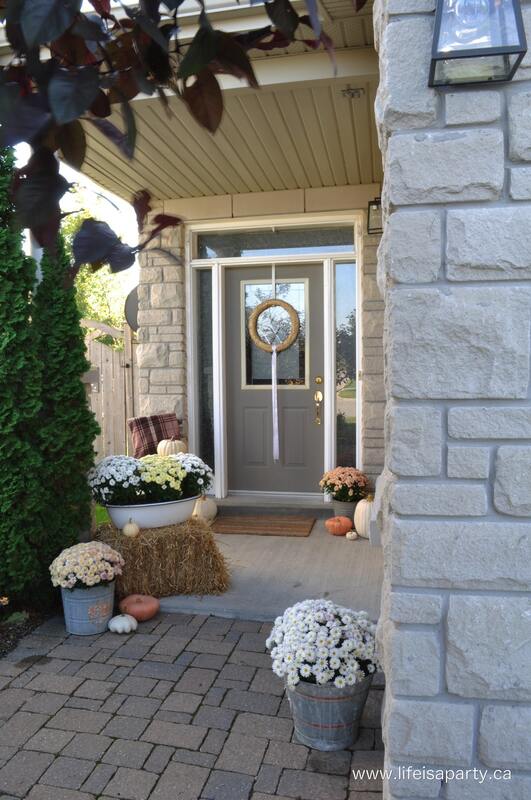 I love the cooler temps, the pumpkin flavoured everything, the leaves changing colour, and all the beautiful decorations. 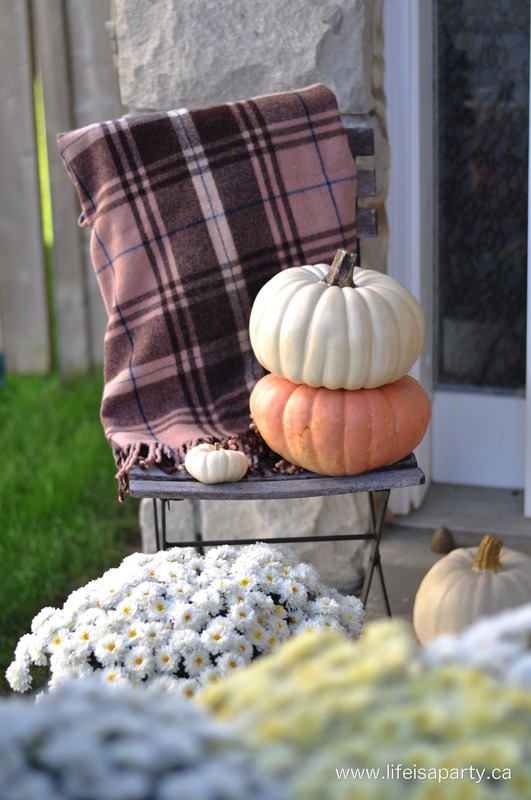 Today I’m sharing my front porch all dressed up for fall. 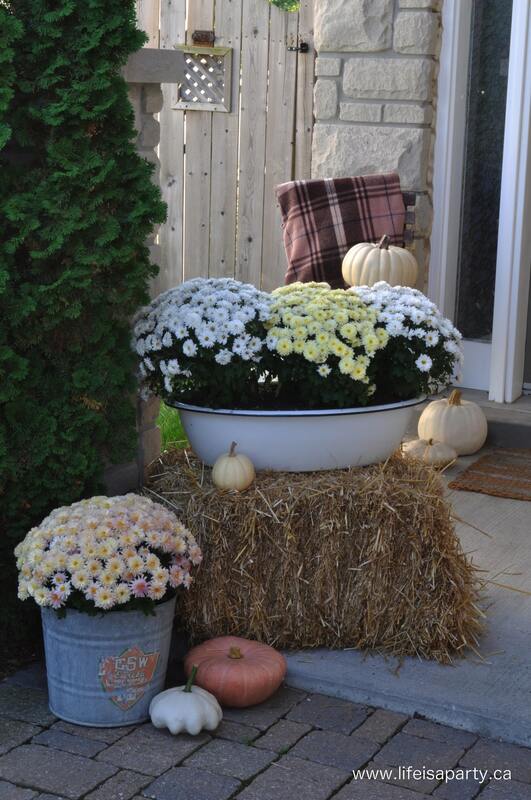 I do like orange pumpkins and all the fall colours, but there’s just something about the white pumpkins, and straw, and white mums that keeps calling my name, and this year was no exception. 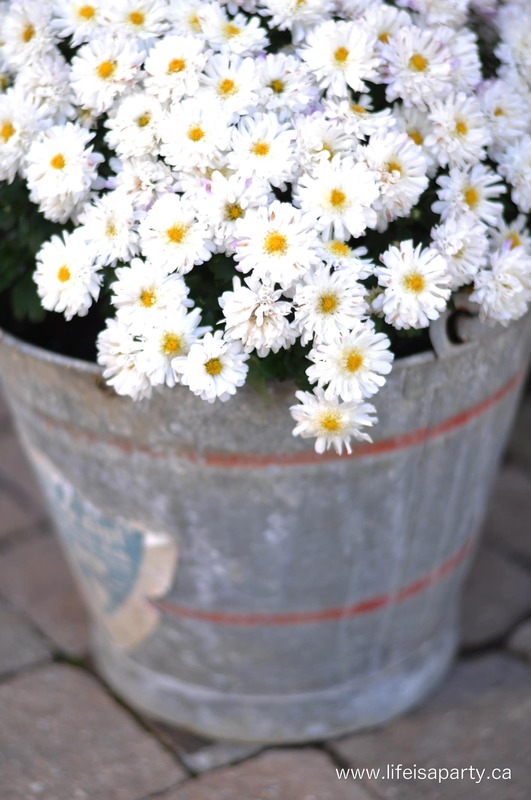 I few weeks ago for my daughters Pink Paris themed birthday party, I sent my sweet husband out to buy some white and pink mums for outside. Since they were just starting to come out, covered in buds but not really open it was tricky for him to tell the exact colour. We ended up with three white and one cream and two sort of peachy, pinky, white. They aren’t pink, but they are super pretty and inspired this neutral with a little peachy pink colour scheme. It was a happy accident, because I love it. 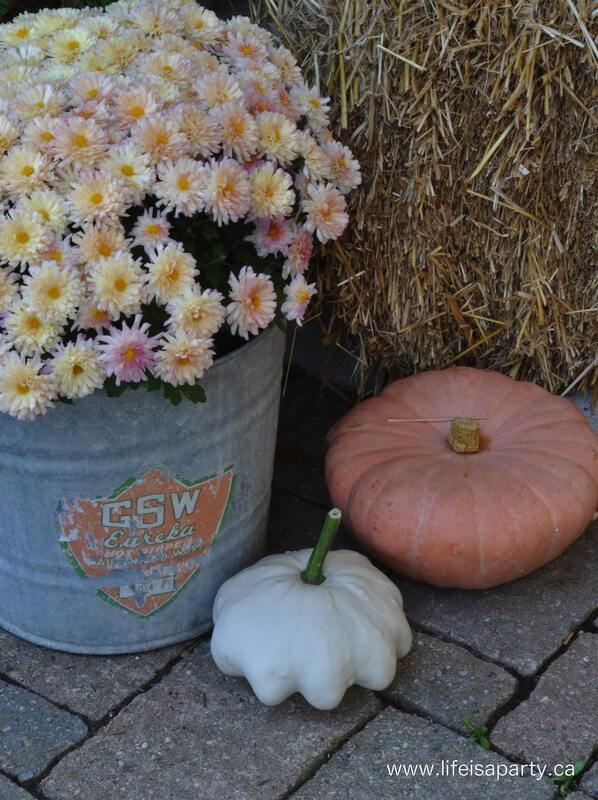 To go with the mums I went searching for and actually found (a rare and wonderful event) pink pumpkins. 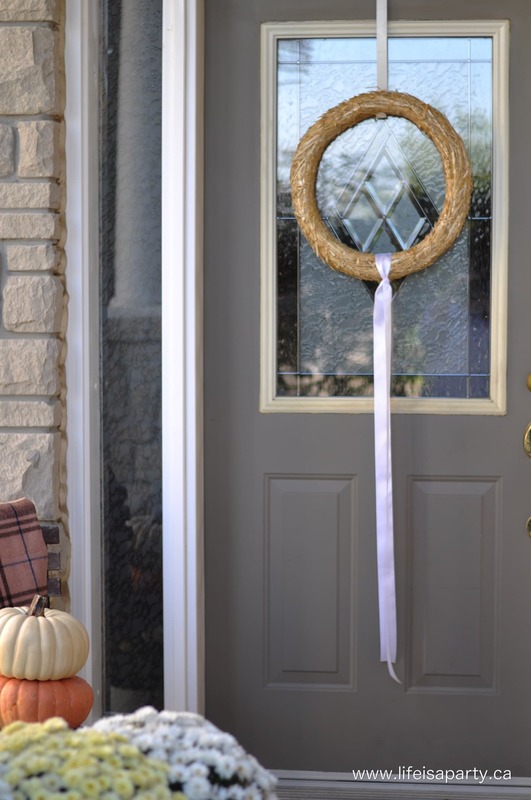 I also added in some pretty white pumpkins and some straw -with a mini straw bale, and a simple straw wreath for the door that I picked up at the craft store, and tied an easy satin ribbon on. Sometimes simple is best. I also, just happen to have the perfect vintage wool blanket. If you follow me on instagram your a good person…and you know that I was at a great antique fall the weekend before last. I came home with a couple treasures and this blanket was one of them. My mom came to the sale for the first time, and I might have dropped a few strategic hints that this would make a great birthday present…and that I’d be willing to hang on to it for her until the end of Nov. when she might want to wrap it up. I just love my little mini tower of pumpkins too. 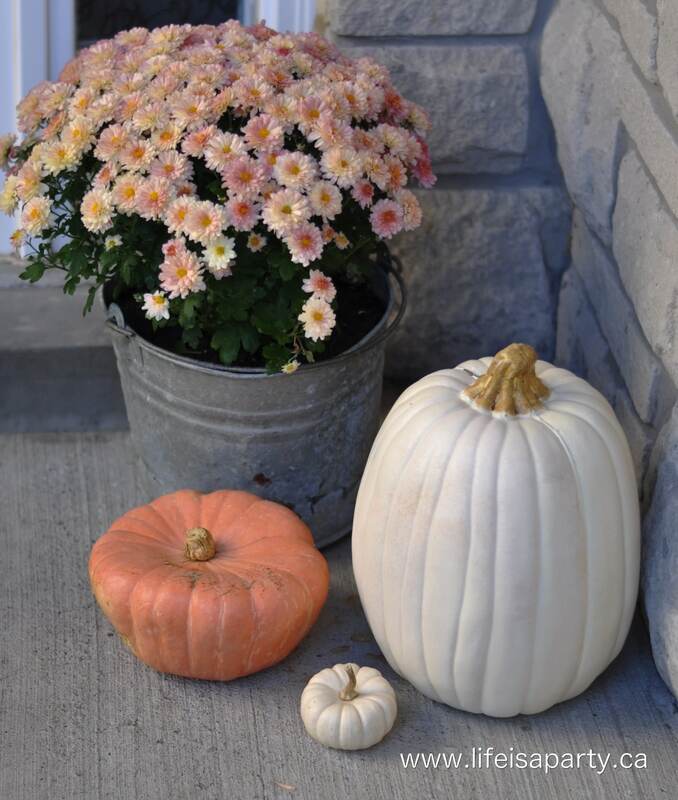 The top one is a fake…I had that moment at the farm like you do, where you’re figuring out how much those amazing $5-10 white pumpkins are going to add up to, and you remember there’s a coupon for the craft store today and they’re on sale. They still cost too much, but let’s call it an investment in future falls to come. 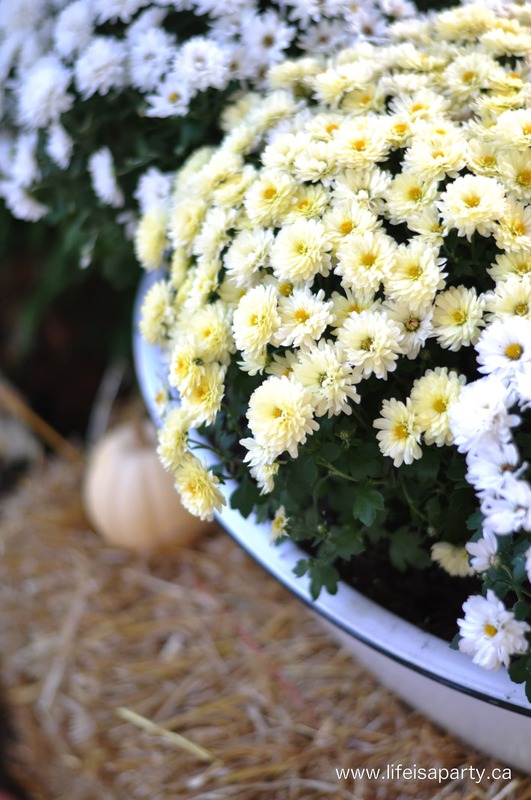 I’m really happy with how it all turned out…now if I can just remember to keep watering the mums. 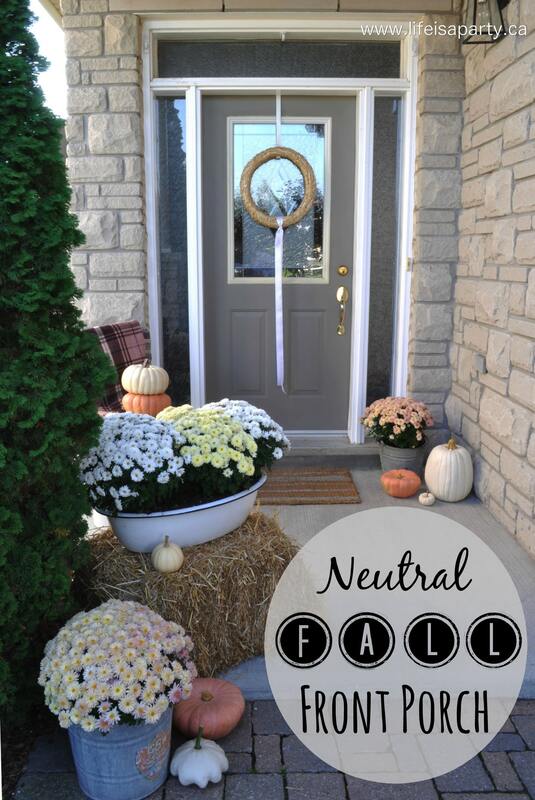 With a pretty neutral fall front porch, life really is a party!